Norwegian oil company STATOIL has been involved with several humanitarian projects in Azerbaijan since it arrived in the country in 1992. For instance, the company recently brought Dr. Maria Odegard from Norway to perform eye surgeries in Baku with the Caspian Compassion Project (CCP). Over two weeks, Dr. Odegard performed a total of 49 cataract operations, including 17 on refugees. She also did a number of consultations with patients. "Eye diseases are often developed in conjunction with diabetes," Dr. Odegard said. "Most of my clients were elderly and not in the best of health. 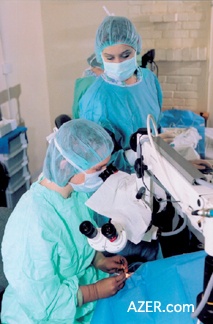 The development of cataracts was often far advanced." Left: STATOIL brought Dr. Maria Odegard to Baku from Norway to perform eye surgeries. CCP is a North American initiative that helps Azerbaijani IDPs and refugees who would not be able to afford an eye operation in a regular hospital. A relatively simple operation gives these patients normal vision after a life of almost total blindness. According to Paal Eitrheim, External Affairs Manager for STATOIL Azerbaijan, Dr. Odegar has already been invited back to Baku to perform more operations. STATOIL has also provided crucial medical supplies for Azerbaijan's leper village at Umbaki, located one and a half hours away from Baku. STATOIL's John Coker, who is currently working on the Shah Deniz project, was instrumental in supplying the villagers with bandages, medicines and other necessities. In partnership with other foreign companies and embassies, STATOIL co-financed the establishment of Azerbaijan's first crisis center for women. The Center, located in central Baku and run by the Institute of Peace and Democracy, offers free medical, legal and psychological advice to women in crisis. "STATOIL was actively involved in the discussions of the idea of the Center from the very beginning, and we enthusiastically support this initiative to help women. When we first saw the building, it was in shambles, but the organizers have done a fantastic job since then," said Jamilya Hajiyeva, External Affairs Advisor with STATOIL Azerbaijan. The crisis center opened in late November 2001 and currently offers a hotline from 10 a.m. until 8 p.m. Once the center becomes fully operational, the hotline will be available 24 hours a day. Left: Leyla Yunus initiated the establishment of a crisis center for women in Baku. Middle: Dr. Maria Odegard performed 49 cataract operations during her stay in Baku. Right: STATOIL donated a van to Azerbaijan's leper community. Other STATOIL projects in the region include an educational project on human rights being run in Azerbaijan by the Norwegian Refugee Council as well as the refurbishment of a power plant in the Gardabani district in Georgia. Norway's STATOIL is one of the world's largest net sellers of crude oil and a substantial supplier of natural gas to Europe. It is a leading Scandinavian retailer of gas and other oil products, and the largest operator on the Norwegian continental shelf. The company has operations in more than 20 countries worldwide. STATOIL established operations in Azerbaijan in the early 1990s; its current interests there include Azeri-Chirag-Gunashli (8.6 percent), Shah Deniz (25.5 percent) and Alov-Araz-Sharg (15 percent). STATOIL also holds a 6.45 percent share in the sponsor group for the BTC pipeline project and is involved in the South Caucasus Gas Pipeline (SCP) from Baku via Georgia to Erzurum, Turkey. Between 1992 and 2000, STATOIL spent more than $20 million U.S. on its activities in Azerbaijan.